The mission of the Joint Trauma System (JTS) is to improve trauma readiness and outcomes through evidence-driven performance improvement. 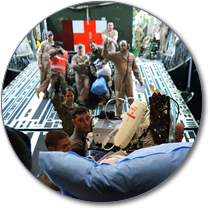 The JTS vision is that every Soldier, Sailor, Airman and Marine injured on the battlefield or in any theater of operations will be provided with the optimum chance for survival and maximum potential for functional recovery. JTS supports US military performance improvement (PI) initiatives and activities by identifying, tracking and making recommendations on efforts to ensure the appropriate evaluation and treatment of injured Service members across the continuum of care, improve medic training and ensure medical readiness. The DoDTR is the first and only DoD trauma patient registry to collect combat casualty care epidemiology, treatments and outcomes from point of injury to recovery. The DoDTR contains identified information taken from medical records, expert clinical inference, scoring and coding schematics, probability determination and PI data. 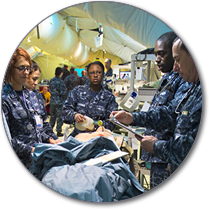 As the DoD Center of Excellence for MHS trauma care delivery, JTS provides the overarching organized and coordinated capability for injury prevention, care and rehabilitation in support of DoD trauma initiatives and activities. JTS performs these functions through Trauma Care Operations; the DoDTR; and PI and Education Divisions. Download the latest copy of the JTS Tactical Combat Casualty Care (TCCC) Guidelines. 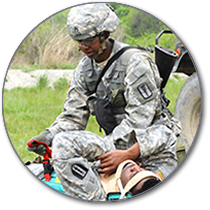 The collection, developed by the JTS Committee on Tactical Combat Casualty Care (CoTCCC), provides military personnel with the resources to implement best medical practices in battlefield trauma care. Through supporting the training of deploying and deployed U.S. military personnel, the material can be used by individuals to engage in self-directed learning, and by instructors as training aids to supplement formal courseware. Download your copy here. 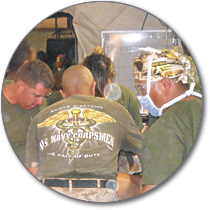 For more TCCC resources, visit the JTS Deployed Medicine site. JTS encourages deployed caregivers to take advantage of the 24/7/365 on-demand real-time telemedicine consultations offered by ADVISOR, the Advanced VIrtual Support for OpeRational Forces system. Real-time teleconsultation brings the expert to the patient in austere settings where the patient cannot be transported to the intensive care unit for definitive care in a timely manner. Real-time support enables direct communication between the remote provider and the clinical subject matter expert, thus facilitating expert management from near the point of injury until definitive care can be administered. ADVISOR facilitates immediate access to expert clinicians in critical care, trauma/general surgery, orthopedics, infectious disease, pediatrics, toxicology, burn care, veterinary medicine, emergency care and other specialties. A training line is available if coordinated ahead of training. ADVISOR also manages an e-mail distribution list to share information such as casualty images, vital signs flowsheet data, and short video clips. To access telehelp or learn more about ADVISOR, click the ADVISOR link on the JTS banner. The link takes you to the ADVISOR site (prolongedfieldcare.org).